Neon Genesis Evangelion has long been one of the favorite series amongst fans of anime, due to its combination of straightforward action with some fascinating supernatural and religious overtones. The show is quite radical and, depending on who you talk to, quite mindblowing. Its creators, however, felt that they didn't have the opportunity to properly conclude the show as they might have wished. In collaboration with Gainax and Production I.G., two 2-part animated features were created to take the place of the final 4 episodes. The projects included Death and Rebirth and, this disc, The End of Evangelion. The goal here is to create an alternate ending to the original series, and offer a vision more in the vein of what was intended. 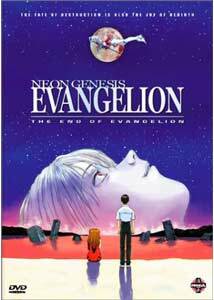 To understand End of Evangelion, one must know something about the original series from which it comes. Set in the future, when mankind has experienced a great apocalypse from which it has recovered, Neon Genesis Evangelion deals with mankind's creation of EVA-Units, or giant, organic robots designed to do battle with Angels. Angels are mysterious, giant creatures that have come to Earth to destroy, although no one is quite sure why. EVA can only be operated by children and unleash tremendous destructive power. The problem is that, behind the scenes, mysterious forces want to manipulate the events between Evangelion robots and the Angels to produce a new apocalypse; one that will cause a new evolution in human consciousness. Evangelion's strange religious overtones regarding the eventual manipulation and redefinition of humanity has earned it points for creativity and emotional effect, but it's also made the series incredibly surreal. End of Evangelion takes all of those concepts and deals with them in the manner most suited to them: by almost abandoning them altogether in favor of an extremely bizarre, abstract conclusion that, in a sense, almost wants not to be taken too seriously. That might sound vague, but anyone who's had any experience with Evangelion knows that personal interpretations of what is seen on screen are often pointless. The events portrayed here, the collapse of NERV, the deaths of central characters, the emotional problems of Shinji, are all handled in a very strange manner. Humanity ends, everyone dies, but everyone doesn't and, in fact, it might all be unreal. Or something like that. That's basically the central theme here and, frankly, it's wonderful. It's so "un-anime" to just abandon the pretensions of a solid plot and a boring "defeat the villain" climax, and that's what makes it so interesting. In the end, you have one of the most unique Japanese animated features since Akira that's as much an artistic triumph as it is a success at ending the themes present in the show from the beginning. What does it all mean? I have no idea, and I guess that's what I liked about it. It challenges the psyche by being totally dependant on the viewers own interpretations of what's going on. Image Transfer Review: As much as I'd love to praise this, I have to be rather honest and admit I was a bit disappointed by the widescreen image. While in general it's clean and crisp, the black level is way off with solid blacks being a very dim gray. This isn't an issue normally, but it does bring out a surprising amount of artifacts in any scene that's just a little dark. This haze of gray makes it hard for colors to liven up, and the "glow" made by this effect just exaggerates artifacts and other pixelization issues. The movie looks good, but in a technical sense, it could have been better. Audio Transfer Review: Most of the disc's bitrate seems to have gone to a whopping 6 audio tracks, including Japanese and English Dolby 6.1 EX, DTS ES, and Stereo Surround. All of them are very good quality and provide just the right amount of surround effects and overall power that fits what's going on in the movie. The Dolby and DTS mixes offer better localization of their effects and are much clearer than the normal stereo, but all the mixes are surprisingly good, though I prefer the Japanese dialogue as opposed to the English dub, which seems to lose some of the weird charm needed for the surreal moments in the film. There are no distortions or clarity problems, and the disc runs at a 10mbps bitrate, which seems to be mostly for the audio, clearly perfected into the most effective mix possible for the material. Extras Review: The film has a full-length audio commentary by Amanda Winn Lee, director of the English voice acting dub, along with contributions from voice actors Taliesin Jaffe and Jason C. Lee. It's a generally interesting look at the approach to localization, and is casual enough to be enjoyable. It's also nice to hear some other opinions on the theme work going on in the show. The rest of the disc is primarily the original promo trailers for End of Evangelion (known as Air/Sincerely Yours in Japan) and dozens of previews and catalog entries for additional Manga material, as well as promo logos for many of the companies involved. While there isn't a wealth of extras here, it would seem most of the disc space was reserved for the mammoth audio content. The keepcase insert folds out into a small poster of the Manga Entertainment cover art found on the case. End of Evangelion will likely be very controversial with hard-line Evangelion fans because it not only alters the end of the original show, but introduces all sorts of debatable concepts. This is a good thing, though, as it makes the end seem as fresh as the beginning.